David G. Hartwell & Patrick Nielsen Hayden, eds. 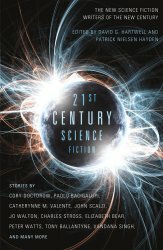 This is the first big retrospective anthology to focus on SF of the 21st century, gathering work by authors who may have debuted earlier, but who "came to prominence" since 2000, as the editors explain in their introduction. Only three of the authors (Stross, Schroeder, and Watts) have appeared in any earlier Hartwell anthology listed here.